This sophisticated three-bedroom country charmer with arched windows front and back is ideal for south-facing lots. The garage is separate from the house but can be accessed through a covered breezeway that is adjacent to the rear deck. Servicing the great room, kitchen and breakfast area, the rear deck is spacious and ideal for outdoor entertaining. The large kitchen includes ample cabinetry and countertop space, in addition to a cooktop island with breakfast bar. Two bedrooms complete one wing of the home, and share a bath and close proximity to the utility room. The sunroom is in the front of the home and features skylights and a cathedral ceiling, creating the ultimate gathering spot for warmer climates. An elegant master suite is positioned for privacy, and includes luxurious details sure to pamper any homeowner. 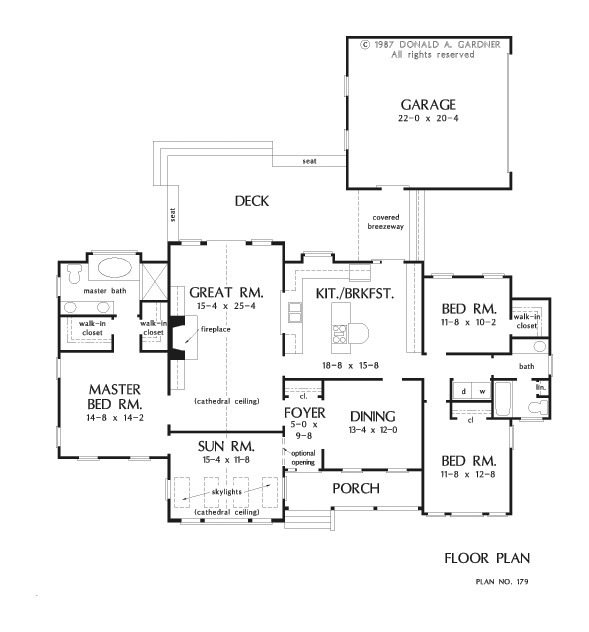 1st Floor: 2053 Sq. Ft.
House Dimensions: 67' 4" x 38' 4"
Great Room: 15' 4" x 25' 4"
Master Bedroom: 14' 8" x 14' 2"
Porch - Front : 18' 8" x 5' 0" x 0' 0"
Deck / Patio : 24' 4" x 11' 8" x 0' 0"
Other (Cathedral): 15' 4" x 11' 8" x 14' 0"
Other #2 : 8' 0" x 9' 8" x 0' 0"
Foyer : 5' 0" x 9' 8" x 8' 0"
Great Room (Cathedral): 15' 4" x 25' 4" x 14' 0"
Kitchen : 18' 8" x 15' 8" x 8' 0"
Utility Room : 5' 4" x 2' 8" x 8' 0"
Master Bedroom : 14' 8" x 14' 2" x 8' 0"
Bedroom #1 : 11' 8" x 10' 2" x 8' 0"
Bedroom #2 : 11' 8" x 12' 8" x 8' 0"